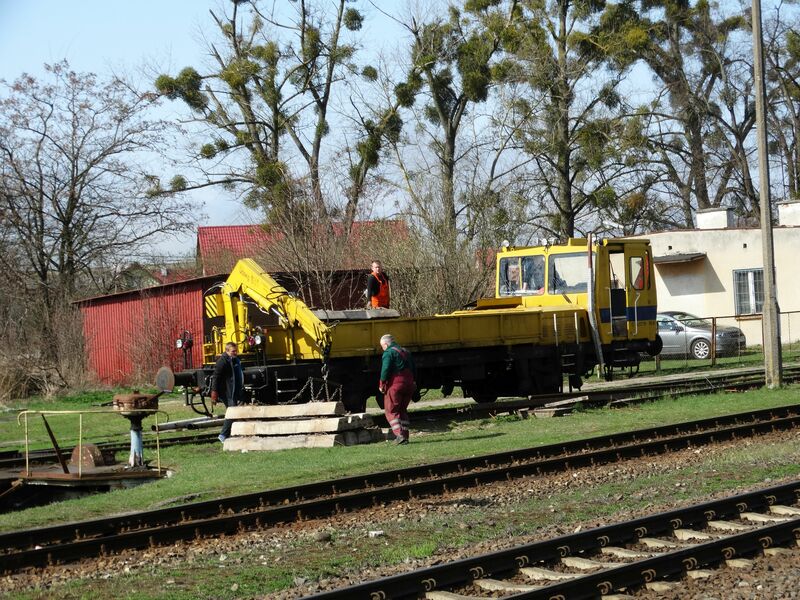 Men changing sleepers with the help of a WM-15S rail truck. 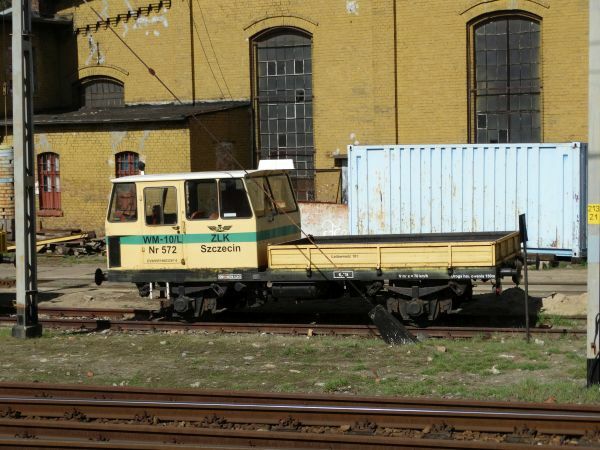 This rail truck model has been built by ZNTK Stargard in Poland and it is also in use in various parts of the former Soviet Union. Picture at Braniewo station 4.4.2017 by Ilkka Siissalo. Almost the same as in the picture above, but not quite. 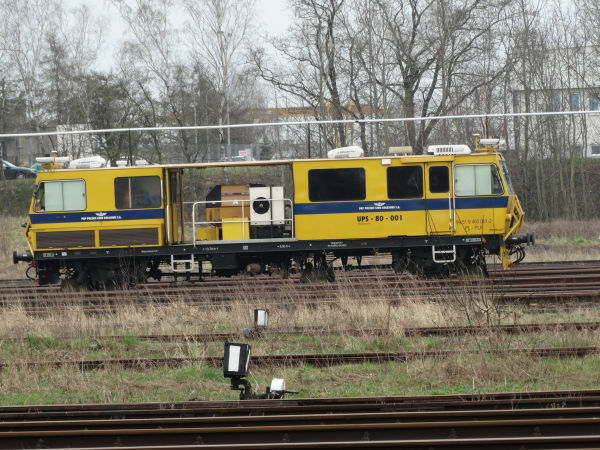 This is a class WM-15A rail truck, owned by PPNT, which is a technology park in Gdynia. Like the one pictured above, this rail truck was built by ZNTK Stargard. 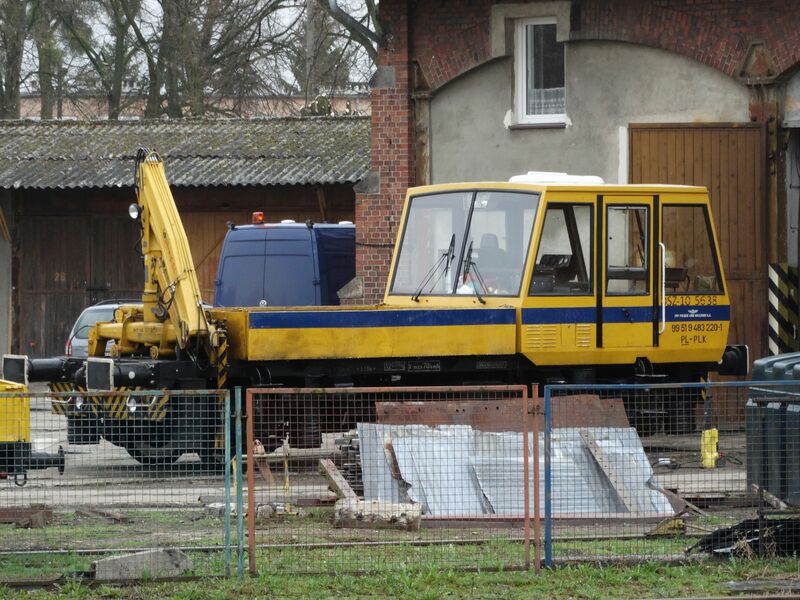 The WM15-A version can lift loads of up to 1,5 tons. Picture in Elblag 4.4.2017 by Ilkka Siissalo. 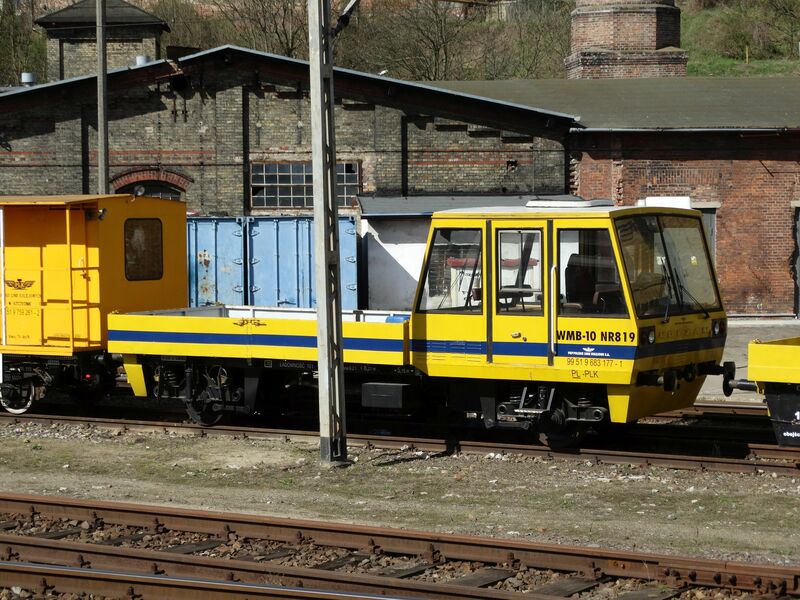 Using a turntable to turn around a WM-15A rail truck and one wagon with welding equipment for rail welding. Picture at Szczecin glowny 6.4.2017 by Ilkka Siissalo. Another WM-15A rail truck. 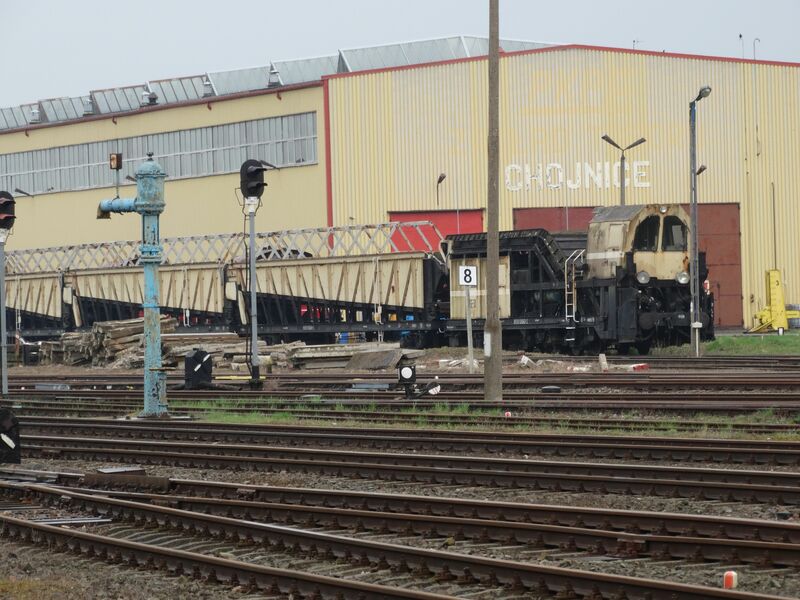 Picture from Częstochowa 28.6.2015 by Ilkka Siissalo. DSZ-10 rail truck of PLK in Korsze. 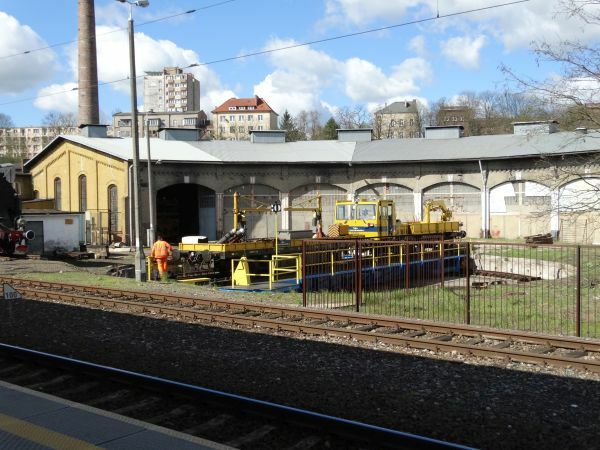 PLK (PKP Polskie Linie Kolejowe) is the infrastructure maintenence division of Polish state railways. 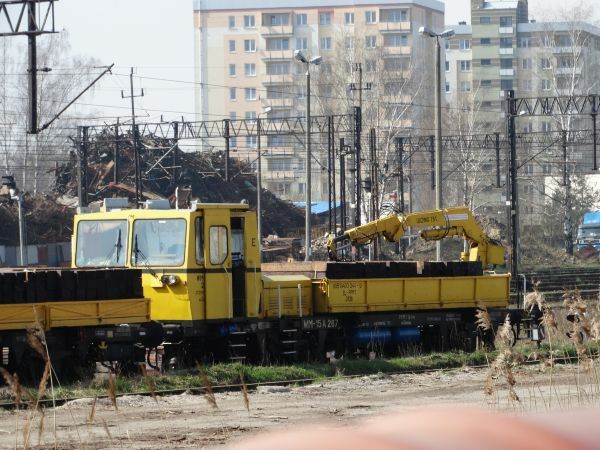 The machine is a Kolzam WM-10 light rail truck. Its power rating is 115kW and max speed is 100 km/h. The machine weighs only 11,5 tons. Picture at the station of Korsze 3.4.2017 by Ilkka Siissalo. 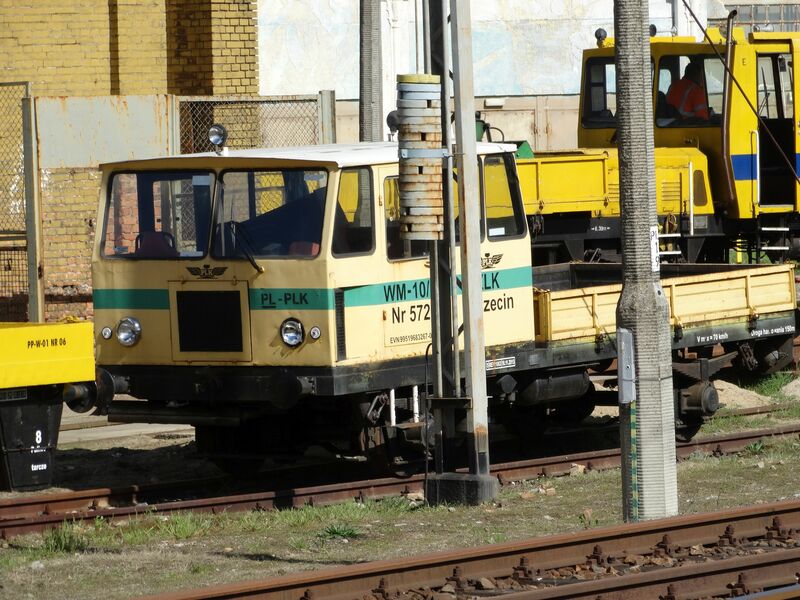 A class WM-10/L rail truck in Szczecin. 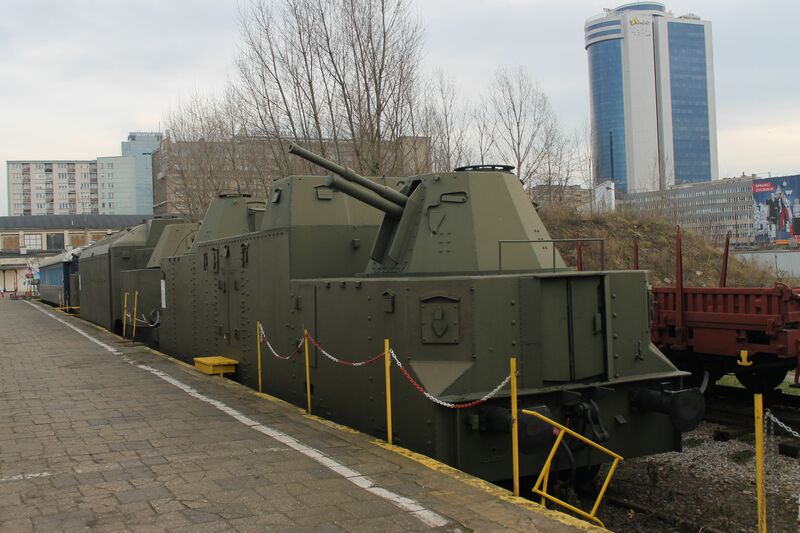 The model was built by Kolzam in Racibórz and it has a top speed of 100 km/h. Picture at Szczecin glowny 6.4.2017 by Ilkka Siissalo. Front of the same old WM-10/L as above. Picture at Szczecin glowny 6.4.2017 by Ilkka Siissalo. The rail truck model WMB-10 is a newer model than the one shown above. It was also produced by Kolzam / KZMiSD in Racibórz since 1987. Picture at Szczecin glowny 6.4.2017 by Ilkka Siissalo. PLK's track geometry measuring wagon UPS-80 in Chojnice 5.4.2017. Picture by Ilkka Siissalo. This very odd looking machine with its wagons is designed to collect snow from tracks and then pack it onto the wagons at the end. At large railway railyards normal snowploughs won't help much, as it would be just pushing the snow from one track to the neighbouring one, so a snow collector is handy. The whole train could then be driven out on the open line, where the wagons could empty their snowload at the trackside. Picture from Chojnice 5.4.2017 by Ilkka Siissalo. Would you wait here for the red sign to turn green? 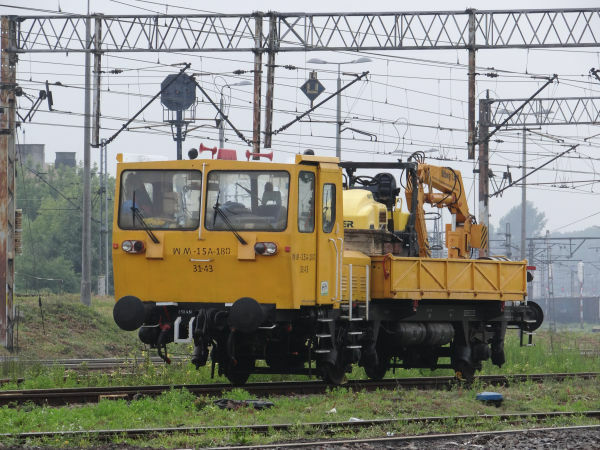 ;-) Picture at Ostroleka station 27.6.2015 by Ilkka Siissalo. This is a normal gauge track inspection vehicle made out of a Warszawa car. 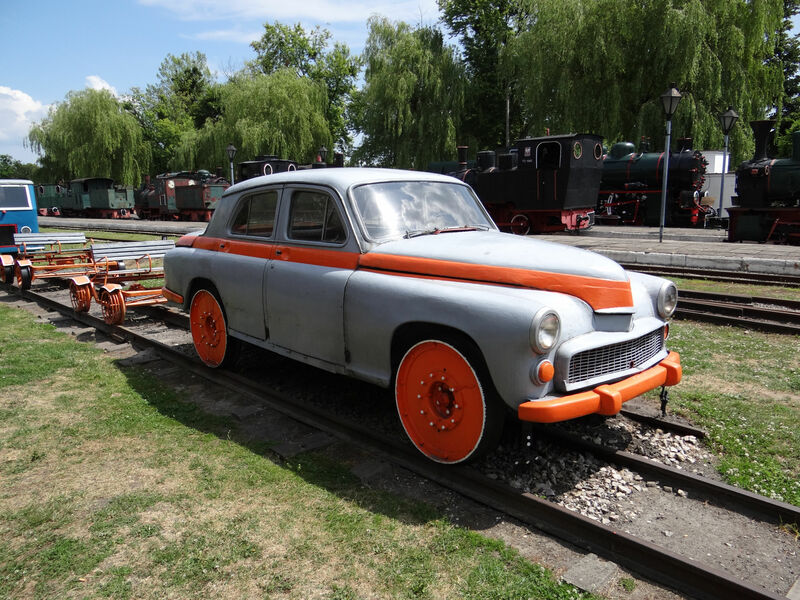 Warszawa was a Polish automobile marque manufactured from 1951 to 1973 by the Fabryka Samochodów Osobowych of Warsaw. The Warszawa was the first new-design Polish car built after the Second World War. Picture from the Sochaczew narrow gauge railway museum 28.6.2015 by Ilkka Siissalo. 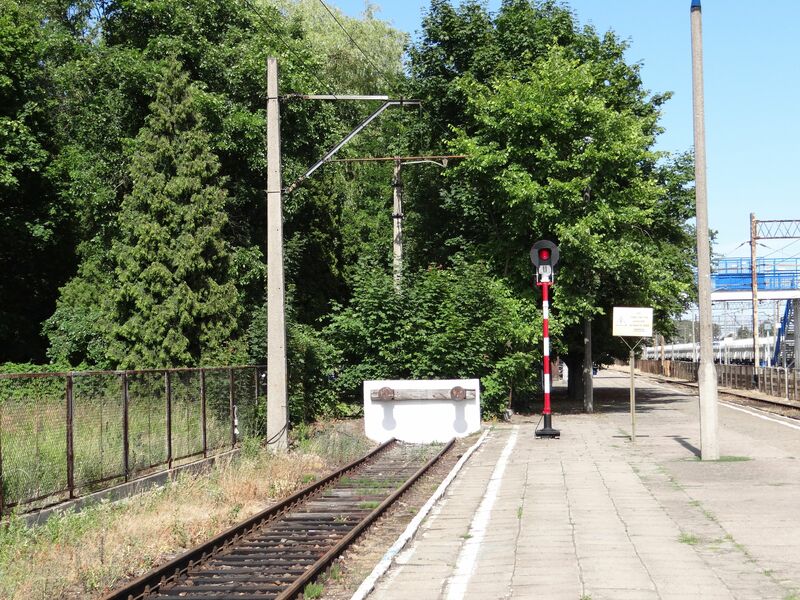 A sad part of railway history in Poland. 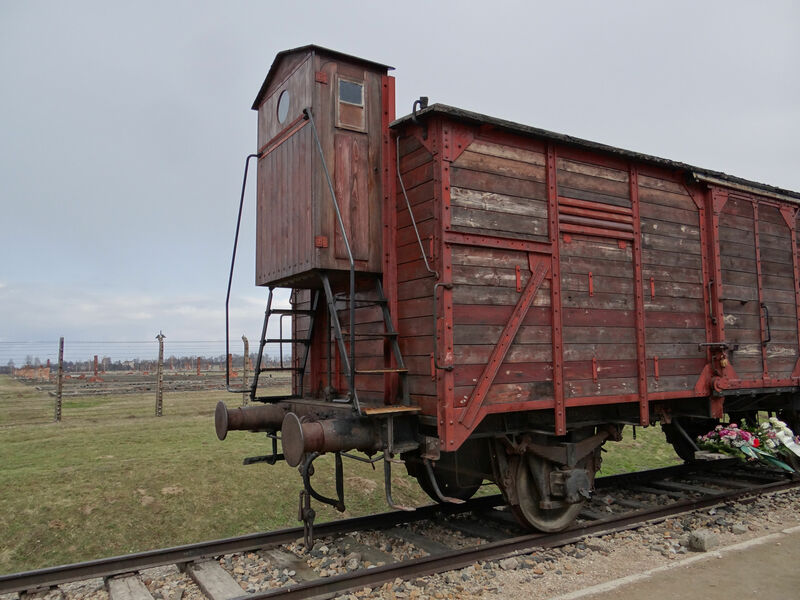 This is a Nazi German railway wagon standing at the Auschwitz-Birkenau concentration camp exactly at the site where jews and other deportees were unloaded from wagons to the extermination camp. Picture from Auschwitz 5.3.2015 by Sanna Siissalo. This picture is from the railway museum in Warsaw (Muzeum Kolejnictwa w Warszawie). The coach on the left is a German DRG (Deutsche Reichsbahn Gesellschaft, state railways of the Nazi German Third Reich) old so called "Donnerbüchse" (thundering tin) wagon of the 1920s. 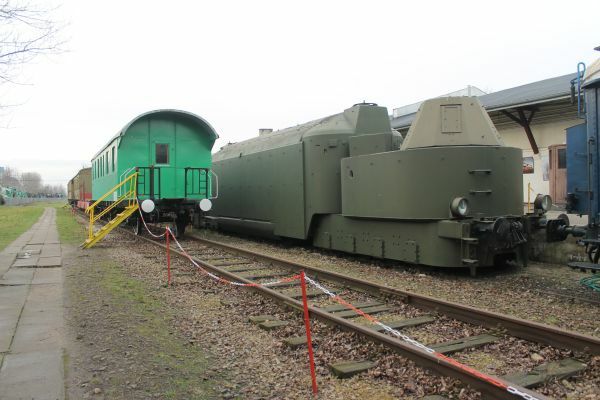 The military train on the right is also German, it is the PzTrWg16 (Panzertruppenwagen 16) armoured, motorised train of the Nazi German army. Picture from train museum in Warsaw 28.12.2017 by Timo Varshukov. Another view of the the PzTrWg16 (Panzertruppenwagen 16) of the Nazi German army.